Starts with the basics. 9 basket patterns including: Pineapple, Beginning Round and Square, Bread, Dinner Roll, Japanese Weave, Simplicity, Outdoor Paper Napkin, and Apple Drying Baskets. 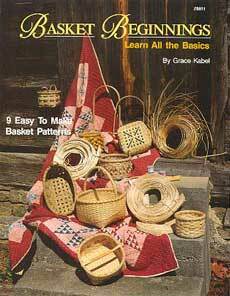 Basket Weaving, Chair Seating, and Gourd Craft Books can be mixed to take advantage of volume discounts.